Queensland Rail has outlined the host of problems on the Mount Isa Line being revealed as floodwaters recede. Chief executive officer Nick Easy said engineers and recovery crews have identified damage across 307km of track between Hughenden and Cloncurry, with extreme erosion identified at 204 sites. 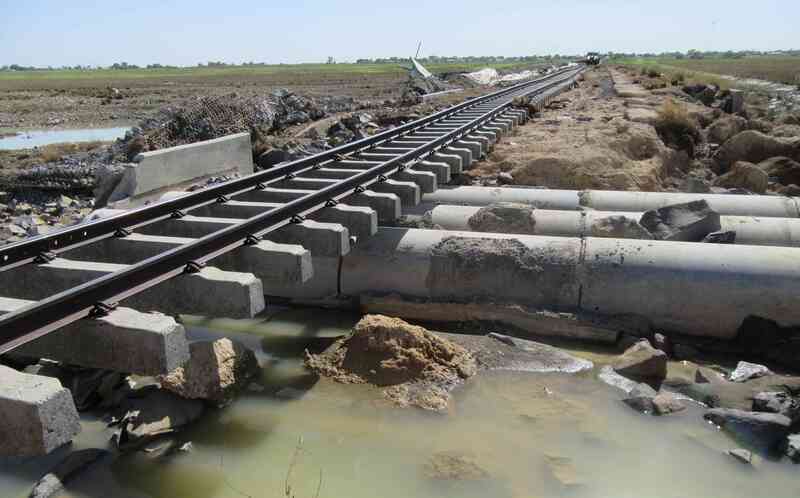 “This includes approximately 40km of major track washouts and 20km of track scouring and work is now underway to confirm required repairs and expected recovery timeframes, taking into account optimum use of all industry resources, plant and equipment,” he said. “All available resources are being mobilised to undertake repairs, including engineers and track teams from South East Queensland, to ensure we return the Mount Isa Line to full operation as soon as possible. Part of the recovery work will include clearing the area at Nelia 50km east of Julia Creek, where a Pacific National train loaded with mineral products was inundated and wagons overturned on February 7. “Any environmental impacts caused by this incident will be taken very seriously,” Mr Easy said. “On Friday, 15 February the Department of Environment and Science issued a ‘Clean Up Notice’ to Queensland Rail, Pacific National and Glencore outlining the key requirements for the site including containment, monitoring, assessment and remediation. Early inspections showed much of the mineral concentrates had remained in the train’s wagons, but that 19 wagons carrying zinc concentrate and two carrying lead concentrate sustained damage, he said.